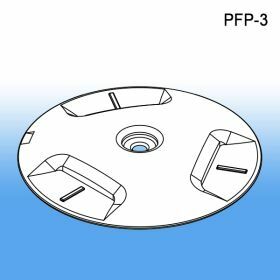 Minimum quantity for "Pallet Floor Protector™, PFP-3" is 250. 250 packed per case, min qty. Attention Retail Store Operators. 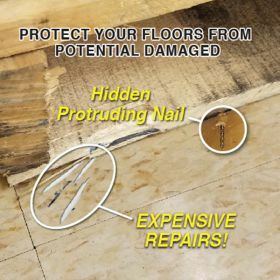 You care about damaged floors; unfortunately Retail Buyers that bring in products do not know or think about this. (And certain warehouses also want immaculate floors). The problem. It starts with your vendor. You Buyer makes an arrangement with a CPG company to create a pallet program with a POP display or stacked product. It's a great promotion and it's an easy truck-to-floor pallet POP display. But it comes with a problem. Wood pallets (aka skids) are used over and over again. They become damaged with wood splinters and protruding nails. This causes damage to your floors. And some pallet companies paint their pallets, which bleed onto your floors. (See photos of a sample damaged floor above with the other photos). What do damage floors cost you? Of course there is the obvious repair cost, (material and labor). But worst of all are the hidden cost of potential loss customers. When a store is visually unappealing customers may not come back and may even tell others about their experience, and we know what that means! Would you like to prevent this from happening? Of course you do. 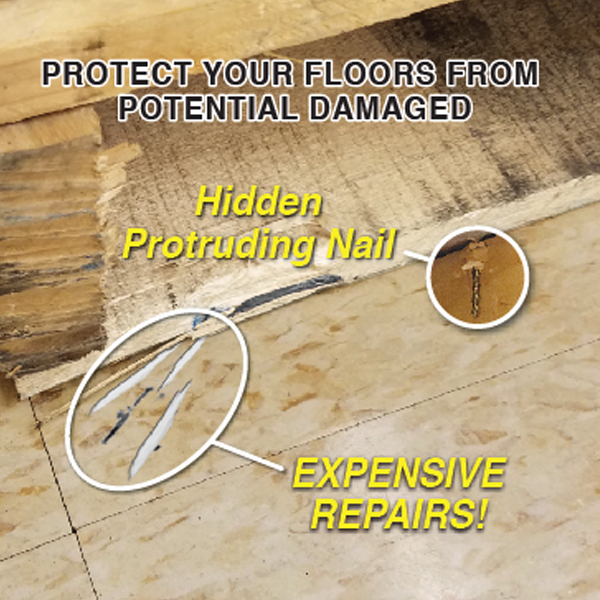 Our Pallet Floor Protector (PFP-3), saves money (repair and replacement costs of floors), saves time (no neded use of plastic stack bases and the labor to add them to a wooden pallet POP display), protects floors and there is no cost to you, the retailer (read "How" below...). The PFP-3 will increase the "Life-Cycle" and "Appearance Retention" of your floors. A major retailer was the exclusive user of our pallet floor protector, until now. 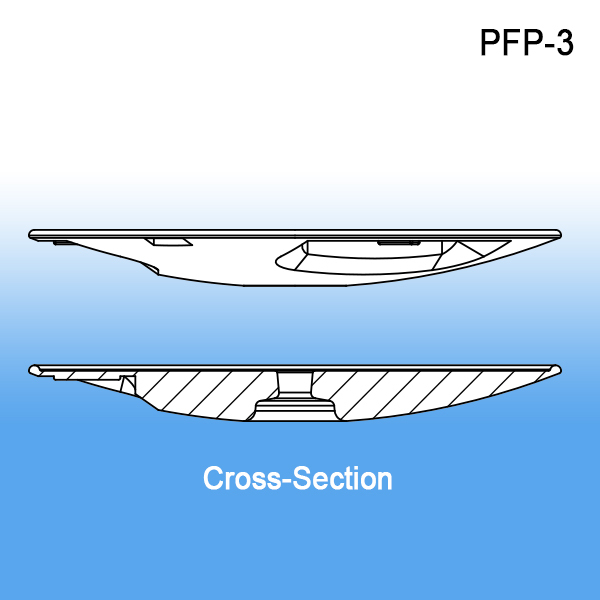 We are now making the PFP-3 available to all retailers. 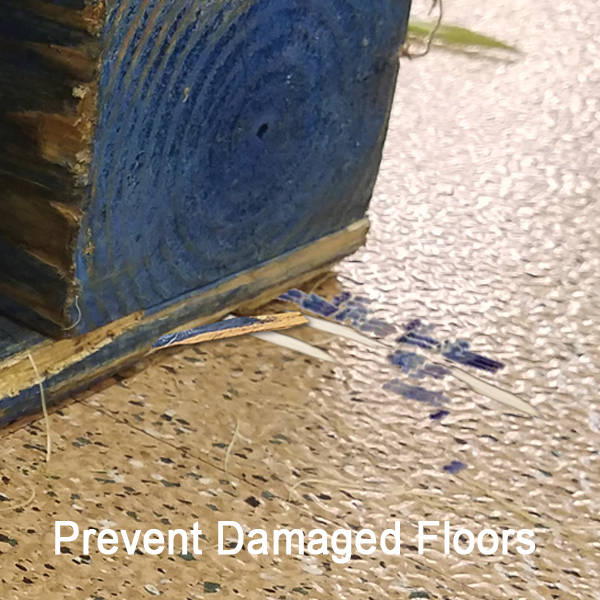 This clever device is made of durable yet gentle high density plastic (see more on material etc below) and is attached to the bottom of a pallet, protecting your floors from scratches, gouges, dings and marks. The PFP-3 is a low cost solution that you mandate to all your suppliers when wooden pallets are used. The investment for your suppliers/vendors is only $1.72 to $2.15 per pallet, depending on the size and weight of the pallet. In addition, installation for your vendors is very quick and simple, see installation sheet here. Not a lot to ask from your vendors, unless they would like to pay for your floor repairs. And when you open up NEW STORES, the last thing you want is all the displays, fixtures, etc; coming into your stores WITHOUT the PFP-3 Pallet Floor Protector™, damaging your beautiful new floors. Insist that all your vendors use the PFP-3 on all pallets (aka skids) and box bases, to prevent premature damage - before you open! Are Plastic Stack Bases The Solution? COMPARE THE COST If you use stack bases below your wooden pallets or you use plastic pallets, you already know that they are expensive and require additional labor and utilize excessive storage space at your stores. 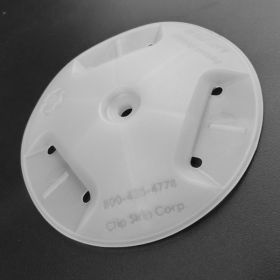 Plastic stack bases cost between $35 - $135 each. And it adds another step to the process of placing your wooden pallet POP display program on the floor. MORE GOOD NEWS. Let's face it, your brand suppliers do not always live up to pallet standards. 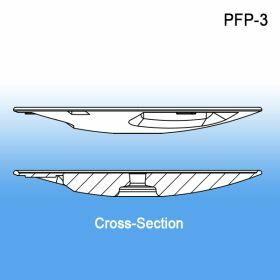 However with the PFP-3 attached to their pallets, you are still protected. Free Samples: If you or your vendors would like a FREE sample, please contact us at 1-800-425-4778, fill this form out here or email us at samples@clipstrip.com and ask for the PFP-3. 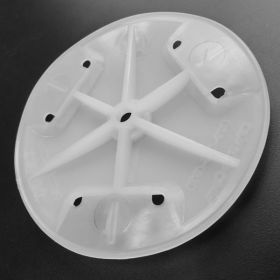 The PFP-3 is made from High Density Polyethylene. HDPE is durable and safe for your floors. The Pallet Floor Protector™ has been tested up to 5,000 lb. loads and -20 degree temperatures. Due to the unique design and material, the Protector will not scratch your floor; thus making standard wood pallets POP friendly. How Does It Work? Your vendor adds 4 or 5 PFP-3's to the bottom of a wood pallet before it is used, which raises the pallet 0.5" off the floor. This creates a much safer and less destructive pallet. The raising of the pallet will also protect corrugated displays from night-time mopping damage. 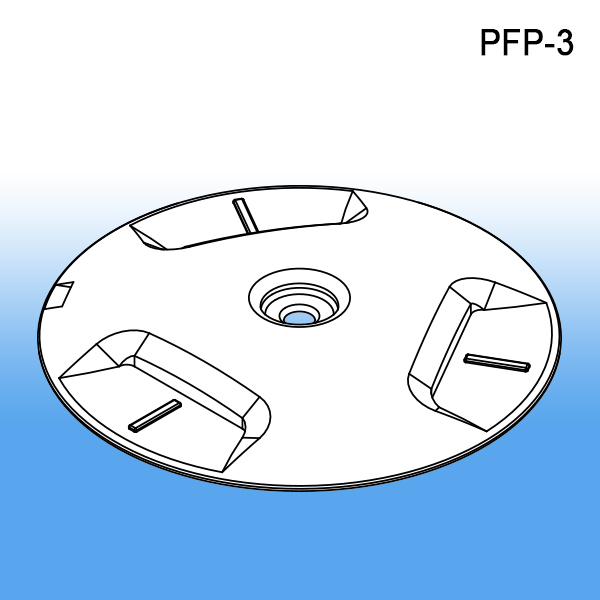 See "How to Install the PFP-3" here. Additional Major Benefit: Due to the unique design and material, the PFP-3 also allows for light weight pallets to be slightly shifted on the floor without the use of pallet jacks and without scratching your floors. They make the sliding and gliding of pallets much easier for store staff. The PFP-3 transforms wooden pallets into a "hybrid" pallet of wood and plastic, where the "less-floor-damage-caused-by-all-plastic-skids", is now a claim attributed to wooden pallets fitted with the PFP-3.